Props to Direct Line: the latest Winston Wolfe advert actually says something useful about their Home Plus Insurance policy. In my original post, I complained that the first set of ads featuring Harvey Keitel were yet another example of insurance companies' boredom with their own products. But the "Roger Rabbit" ad uses The Wolf to highlight the "cash or new replacement" feature of Direct Line's Home Plus Insurance in an amusing and engaging way. Buy this policy and if your stuff is damaged beyond repair (or stolen), Direct Line will give you the choice of cash or a brand new replacement. Who is Winston Wolfe anyway? Winston Wolfe (or simply "The Wolf") is a character in Quentin Tarantino's cult film Pulp Fiction (1994). In a memorable cameo by Harvey Keitel, The Wolf helps Vincent (John Travolta) and Jules (Samuel L. Jackson) clean up after Vincent has accidentally shot Marvin (played by Phil LaMarr) dead when driving over a bump in the road with his handgun cocked. There's an interesting Twitter debate going on about Direct Line's new Winston Wolf / I solve Problems ad campaign. Direct Line Winston Wolf TV ad. Marketing genius. In case you haven't seen the campaign yet, it features Harvey Keitel reprising his own "fixer" role from Pulp Fiction to highlight the benefits of Direct Line's Home Insurance and Car Insurance products. (Scroll to the bottom if you'd like to watch the videos). Personally, I admire the ads as parody, and I can't get too worked up about the suggestion that Harvey Keitel has "sold out" (he has already used the same persona to advertise whiskey, Gatorade, and petrol after all). Nor do I think it's after its time, since it will appeal to people now in their 30s and 40s for whom Pulp Fiction was a defining movie of their youth. 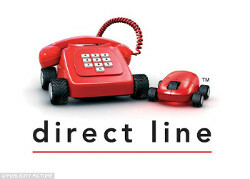 For me, the sad thing about the campaign is that Direct Line has joined the long list of insurance brands who are resigned to the idea that they are in an inherently boring business. Insurance has been written off by advertising agencies as "low interest category" - one where people can only be engaged through celebrity endorsement (Snoop Dogg, Paul Whitehouse) or a quirky animated character (Aleksandr Orlov, Brian The Robot). And insurance brands have given up trying to find alternatives. At Bought By Many, we've had a very different experience. By talking to people about the things they really care about - from Staffordshire Bull Terriers to Epilepsy - we've seen people show actual interest in talking about insurance. As social media supplants TV as the most important channel for building awareness, other insurance companies will need to think differently about how they tell their story too. He's even turned his hand to advertising Direct Line's Drive Plus black box insurance for young drivers. You can read our reviews of the best black box providers here.